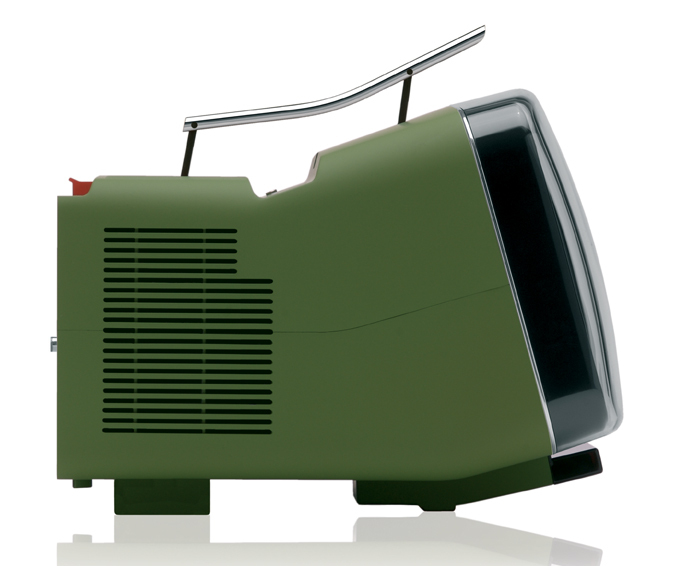 Brionvega Algol Portable TV. A Classic Reborn. As anyone who reads my posts will attest, I am a design geek, and I do love my media gadgets. 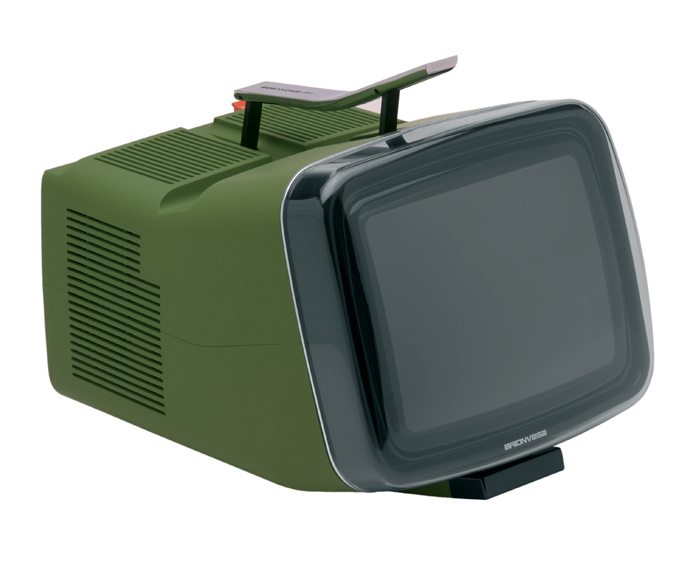 This morning I came across the Brionvega Algol portable TV, which has been updated and reissued for the 21st century. 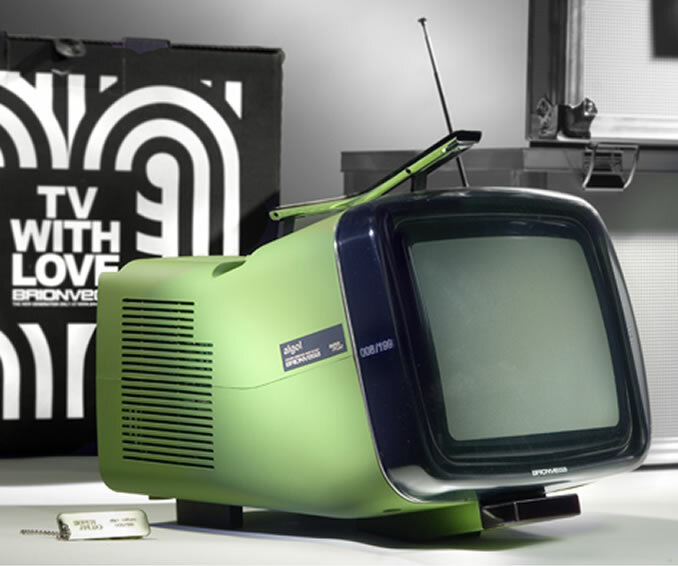 I remember seeing this TV set back in the 70’s and thinking how cool it was then with its bright orange case, chrome details, and amazing 8 inch black and white screen. Algol today combines new technologies with the nostalgic memories of a classic design, and memories of portability. The original design by Richard Sapper and Marco Zanuso Algol was quirky with a bright orange color, and upturned nose. Today’s version looks like the original but is offered in a bright grass green instead of orange. It has the same chrome handle, rounded edges and retro styling that made the original an instant classic. In a period of silver black ginormous flat screen TVs Algol is a breath of fresh air. The new set features a 10 inch PAL color screen, with a hyper band OTA tuner, multi-function remote, and an aluminum case. To bad it doesn’t have Wifi, for sharing with your home computer/media library. The Algol is being produced in a Limited Edition run, with a total of 199 pieces in military green with a rubberised matte finish. Because of the limited run, the set will cost you 2500.00 Euro. That breaks down to $3500.00. The original design is exhibited in the Metropolitan Museum of Modern Arts. Marco Zanuso was born in Milan in 1916 and died in 2001. He acted as architect, designer and town planner and graduated in 1939 in architecture. The German Richard Sapper, living in Italy, is one of the most significant designers and university professors of the past 30 years. Posted in Appliances, Design and Art, Postaday 2011, Technology, Television and tagged Algol, Brionvega, Brionvega Algol portable TV, Marco Zanuso, Metropolitan Museum of Modern Arts, Portable TV Set, postaday 2011, postaday2011, Richard Sapper on June 30, 2011 by Author.